Ford is a cultural force who is quickly growing from cult status to a household name. He has 1.5 million Facebook fans, 270,000 Twitter followers and 100 million YouTube views, and has sold more than a million albums and has millions of downloads. The genre of country music is constantly changing—that’s part of what makes it special. Ford puts his own spin on country music and hip-hop rhythms. He compares his unique style to the spoken-word songs of Tex Williams (“Smoke, Smoke, Smoke That Cigarette”), Roger Miller (“Hot Rod Lincoln”), Johnny Cash (“A Boy Named Sue”) or C.W. McCall (“Convoy”). Ford’s fifth studio album, “Thanks for Listening,” was released July 1. It debuted at No. 2 on the Billboard Country Chart. Special guests featured on the new album include Keith Urban, Willie Robertson, Lee Brice, Justin Moore, Randy Houser, Jarrod Niemann and Walker Hayes. Most recently, Ford has recently been on the road with Toby Keith in the “Shut Up and Hold On” tour. Artist Demun Jones is opening for Ford. Jones’ first mainstream credit as a songwriter came on the title track of Ford’s popular “Ride Through the Country,” which also featured John Michael Montgomery and was among the first country rap hits. Jones described his band’s music as “extreme crunk country redneck rap.” He wanted to bring something to country rap/hickhop that wasn’t there already. The creative process, for Jones, often began with a drum beat or chord progression on the guitar, while each song’s story was influenced by characters—friends, family and actual folks from the heart of Georgia—and the experiences that Jones had come across throughout his life growing up in Jones County, Ga.
Ford said he is excited to have Jones on board. Tickets can be bought online for $30 in advance at www.whiskeyjacques.com or for $35 at the door the day of show. 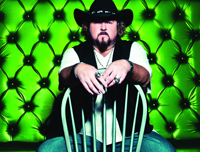 Doors open at 9 p.m. For more information on the artists, go to www.coltford.com or www.demunjones.com.